The Stirling Castle Quilters were established twenty years ago, following a major exhibition on Scottish quilting at the Stirling Smith. They are celebrating their achievements in a Smith exhibition which runs until the end of the month. There are over 60 colourful quilts, with many hangings, cushions, bags and other quilted accessories. 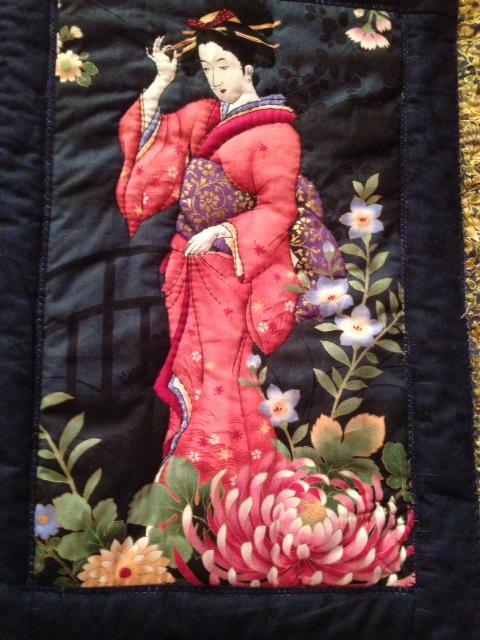 Shown here is a decorative quilted panel, Geisha in the Garden by Lynne Laing. It is one of seven panels with a Japanese theme. Quilting is an international art which goes back to prehistoric times, with layers stitched together and padded for warmth both for clothing and bedding. It has often been a communal art form, with quilters helping each other on the bigger productions. The International Quilters’ Association claims to have been ‘Piecing the world together since 1979’ and there are many examples of collaborative work in the Stirling show. In some countries, quilting is big business. The Tokyo International Great Quilt Festival, supported by Japanese Public Television, has been running every January since 2001. Other international quilt festivals are run in Chicago, Houston Texas, Santa Clara and Dubai, and some of these shows feature up to 800 quilts. However, these events last only a few days or a week at most. The Stirling show still has 11 days of its 6 week run, so come and meet the local quilters and make the most of it!